The art of Guy Chase, including works such as Untitled (Smiley Daisy Devotional), at once announces itself as a sacramental work, even including an actual devotional text, and also poses certain questions about how works of art function within a person’s faith practice. Chase’s example is both a caution and encouragement in considering the visual arts as a medium of spiritual growth. Sometimes pictures that are made and employed as part of a devotional reflection place an excessive emphasis on what the artist or viewer brings to or finds in that spiritual and creative process. Without dismissing what may be true and faithful attempts to respond and relate to God through creative expression and artistic meditation, Chase remained vigilant in his cognizance of his own visual inattentiveness, personal self-absorption, and spiritual complacency. Although he described his work as an attempt that “memorialized a moment that became sacred to me: the moment when [divine] inspiration occurs,” Chase’s art commenced from a posture of humility, from an inability to pray and failure to concentrate. Chase described the intention behind Untitled (Smiley Daisy Devotional) as a response to the self-evident religiosity of gold-background altarpieces, pious portraits, and spiritualized abstractions. If God is able to reveal himself in the sanctified, that area set aside for him, can he penetrate those places and moments that have not been set aside from the routines of daily life? Is God’s ability to reveal his presence dependent on or limited by us? Chase described Untitled (Smiley Daisy Devotional) as a prayer, “If the process is sufficiently meditative, quiet, and constant, surely [God] will be there. It’s easy to pray in the closet, to listen and be present. But what about those noisy moments when the mundane life gets in the way?” He added, “My choices [in Untitled (Smiley Daisy Devotional)] were meant to make it more difficult to concentrate. I made a painting with a daily devotional book glued to the lower part and a big flower-power daisy above it with a smiley face…. Can you do your devotional with a daisy smiling down at you?” Chase’s art examines what we need and do not need to be paying attention and be prayerfully present in moments of devotion. Although Chase’s method was an apophatic strategy of reduction, limitation, and distraction, what might be called ‘via negativa,’ the effect of his art is very positive and optimistic. Emerging from this process of waiting Chase’s art is a witness of the rewards of faithfulness. His art’s humility and humor encourages a delight in the invisible through a contemplation of the visible. Or is it the other way around, can we better appreciate the visible through contemplation of the invisible? Chase was able to see and manifest these as reconciled. 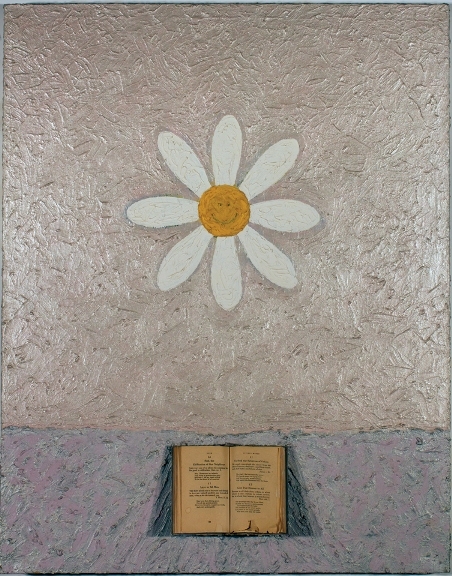 Guy Chase: Untitled (Smiley Daisy Devotional), acrylic, silica sand, and book on canvas, 48 x 36 inches, 1986. Guy Chase passed away on August 18, 2011 at age 56, after a battle with cancer. For more information about Chase’s art please visit his website www.guychase.net or see The Art of Guy Chase, James Romaine, ed., published by Square Halo Books in 2011, available from Amazon.com. James Romaine is a New York City based art historian who is an Associate Professor of Art History at Nyack College. He has a Master’s degree in art history, with a thesis entitled A Modern Devotion: The Faith and Art of Vincent van Gogh, from the University of South Carolina and a Ph.D. in art history from the Graduate Center of the City University of New York. He is the cofounder of the Association of Scholars of Christianity in the History of Art, www.christianityhistoryart.org.